If we had a dollar for every useless pair of socks we’ve received as a holiday gift, we might have enough money to buy ourselves what we really wanted in the first place. Anyway. Just get them what they really want, ok? We even did all the legwork for you, so there’s no excuses this year. Anything that resembles a Storm Trooper mask deserves a place in your bathroom. It’s under $100. It’s the latest in health tech. And it makes you more attractive in a mere 90 seconds. What more could you possibly ask for? The WaterPik gets into all the nooks and crannies of your gums to clean in all the places your normal toothbrush and string floss can’t reach. Dentists everywhere are red in the face, shouting, “YOU’RE BLEEDING BECAUSE YOU DON’T FLOSS ENOUGH” at strangers on the street for lack of purpose in the examination room. The best part of this gift? You can use it too. Everyone wins. Except the dentists. The bottle’s shape will remind you of how you could look if you drank more of it. Kick your boring old water to the curb (not really, because we’re in a drought) and trade it in for a hint subscription box. Hint is naturally-flavored fruit-infused water in a variety of flavors (including caffeinated flavors!) that come in a set of cases each month. Subscription boxes make a great gift because they’re like a little surprise every so often, so the holidays can come again and again...far longer than you’d even realized, because you keep forgetting to adjust your subscription settings. Hint is sugar-free and was based on the idea that making healthy decisions doesn’t have to be painful. This gift is great if you’re really bad at confrontation but are trying to find a way to tell your partner that their addiction to diet sodas is ruining your bank account and your desire for romance. Nothing screams “I’m an adult!” like compromise. And neutrals. Our complete bedding sets come with our signature snap design, which prevents midnight sheet-tangling by keeping the top sheet exactly where it belongs all night long. It’s also a great solution for couples who can’t seem to agree on a consistent bedroom temperature; if one is a living ice sculpture and the other is constant furnace, getting comfortable is as easy as unsnapping the duvet on one side so the furnace can cool off while the ice sculpture can stay warm. If your problems in the bedroom have more to do with what’s happening when you’re both unconscious, our bedding set is your hail Mary -- and it’s cheaper than couple’s therapy. For the sibling who fears commitment. Seriously, Kyle, why couldn’t you just stay with that nice girl from church? She was so nice. Also, take that lip ring out, you look ridiculous. With a face like that, how could you not feel calm and put-together? Maybe he keeps changing his mind and his identity because he doesn’t know who he is yet. If he can’t seem to settle down long enough to reflect on what’s working (his razor-sharp wit and charm) and what’s not (that lip ring. Seriously, what were you thinking? ), get him the gift of guided meditation with a subscription to Headspace. This app walks you step-by-step through breathing, calming, and relaxation practices to quiet even the most chaotic of minds. Better yet, it teaches you how to do it yourself, so you can feel empowered and ready to tackle anything life throws at you. Each subscription includes access to hundreds of hours of Sleep Sounds, meditations, and lessons by a former monk. If after sitting quietly and omming for thirty minutes doesn’t bring Kyle back to center, we don’t know what will. It’s definitely not that lip ring. TENS stands for something scientific, but we like to think it’s because this product is a 10/10. Your sister may not be able to keep a consistent schedule for more than a week at a time, but if there’s one thing in her life that’ll always follow up on time, it’s her period. Make it a little more bearable with a TENS Machine. This tiny-but-mighty device uses electromagnetic stimulation to ease muscle pain and soothe spasms. Some people smarter than us say that TENS therapy 20 minutes a day can help block pain signals, increase strength and endurance, and speed up recovery. She’s into all that “woo-woo” witchy stuff anyway, isn’t she? Give her the gift of science. Maybe she’ll come to her senses this year. Let them know you love and support them…which is why you want them to sleep better so they can dream up a better hobby. Maybe you’re one of the lucky ones who grew up with a sibling too far behind of you in life to really ~get~ them and their interests, but too close to your age that it wouldn’t be weird for you to just send them a card. Last time you saw them, they were really into sports, but now they’re all about keto? Is that right? Fortunately, our percale cotton collection has our signature snap design and a variety of colors to please anyone at any phase in their life. Regardless of what your mom tells you they’re into these days, everyone could use a little more sleep. For the parents, boss, or super-successful best friend who already have everything they want and everything you have ever wanted. But whatever. Giving your rich friends and family members gifts always feels a little like presenting your mom with a macaroni necklace while she’s wearing an original Swarovski, doesn’t it? Step up your game this year - we’re talkin’ cubic zirconia MINIMUM. Metaphorically speaking, of course. Yogas and slip n’ slides don’t go together. Well, maybe they do, but in your standard studio. They may think they have everything they’ve ever even briefly wanted, but now’s your chance to show them what they never knew they wanted. Things that you wouldn’t have even considered a necessity until you realized, “actually? That’s a pretty good idea.” Enter the Nanga Yoga mat. Your rich friend or family member may believe they’ve dabbled in every hobby known to man, but how much time have they actually spent enjoying those hobbies instead of collecting them? The Nanga Yoga mat makes it possible to appreciate every movement and pose without worrying about your towel bunching up and slipping your Downward Dog into Dead Dog. With thick, durable padding and material that repels sweat and other unsavory yoga smells, you may just reawaken your exorbitantly rich friends’ passion for something that was created as a humbling exercise. You don’t actually have to refill it from an old-timey spigot, but it certainly doesn’t hurt. Everyone knows that rich people drink nothing but Dom Perignon out of diamond bottles, right? 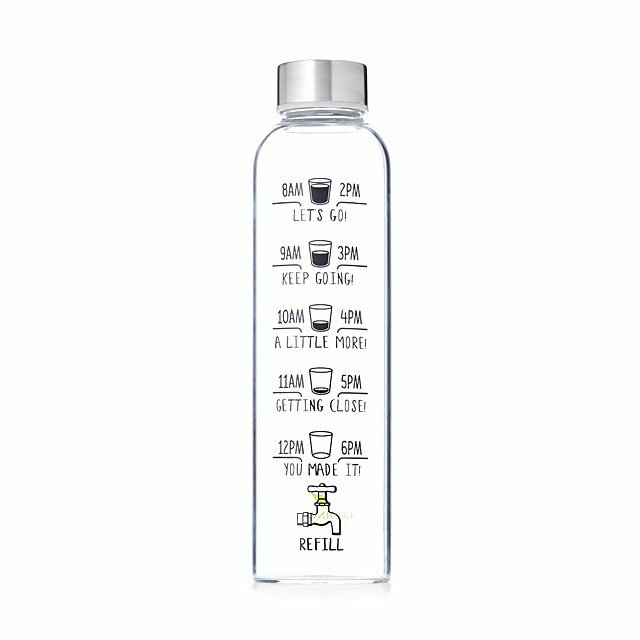 Remind them to take a hydration break with this Drink More Water Bottle, complete with illustrations to spell it all out for them throughout the day. Staying hydrated will help firm and clear up their skin too, so they can save money on those weekly bee venom facials. When it comes to shopping for those who are known on a first-name basis at the Hamptons Four Seasons, it’s the simplest things that make the best gifts. When you give them something that’ll benefit them in the long run, you’re showing them you care about investing in their future self. Use the word “investment” too, they like stuff like that. Gold-plated watches, platinum earrings - what are they missing? Oh yeah, a silver pillow. Our Pillow No. 47 is woven with silver fibers which, while certainly an ego boost to sleep atop, serve the purpose of keeping your face and hair clean while fighting moisture and bacteria during the night. Best suited for sleep contortionists who constantly change their position during the night, the Pillow is a great gift for those who have everything except a solution for under-eye bags. The pillow feels gel-like, yet firm around the gray gusset, so it keeps its shape no matter how many times you have to throw it in the wash after getting King Louis Cognac all over it - again. Did we miss anyone? Still not sure what to get that person who falls into a weirdly specific category? Head on over to primarygoods.com to browse gifts that’ll delight and excite everyone who sleeps. So, probably not vampires. Or these people.